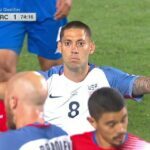 Clint Dempsey came off the bench to spark the U.S. to a 2-0 victory over Costa Rica in the Gold Cup semifinals, scoring his 57th career international goal in the process. Dempsey entered the match in the 66th minute and set up Jozy Altidore for the first goal of the match (and Altidore’s first in 10 appearances). 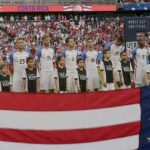 He then curled a free kick around the wall in the 82nd minute to match Landon Donovan as the U.S.’s all-time leading scorer in his home state of Texas and with Donovan in the broadcast booth. Dempsey reached 57 goals in 22 fewer appearances than Donovan. In the moment, Donovan joked that he stop now so they can share the honor. Of course, all of this will soon be moot when Christian Pulisic blows past them both before his 25th birthday. In fact, the only reason Pulisic doesn’t currently have sole possession of this record himself is because he graciously opted not to play in the Gold Cup so Dempsey could have his moment in the sun before Pulisic scores an even hundo. In other words, this is like two squirrels eating the same nut just before a dragon swoops down and swallows the entire planet whole. Just to be clear, the giant, intergalactic dragon in this scenario is Christian Pulisic. Anyway, congrats to Clint Dempsey on his achievement.